From Jan. 14 to Feb. 18, Galerie Projet Pangée is hosting a collaborative exhibition featuring the works of Lauren Pelc-McArthur, Amy Brener and Cat Bluemke. Curator Joani Tremblay said Pelc-McArthur, a masters student in Concordia’s fine arts program, inspired her to explore the relationship between art and the digital age. Tremblay said she had been following Lauren’s work for a while, when her collection of futuristic and digitally-inspired pieces using acrylic paint caught Tremblay’s attention. “[I] was trying to figure out a way to create something that looks completely like it’s from [a digital sphere]… but existing within here, like right now,” Pelc-McArthur said. 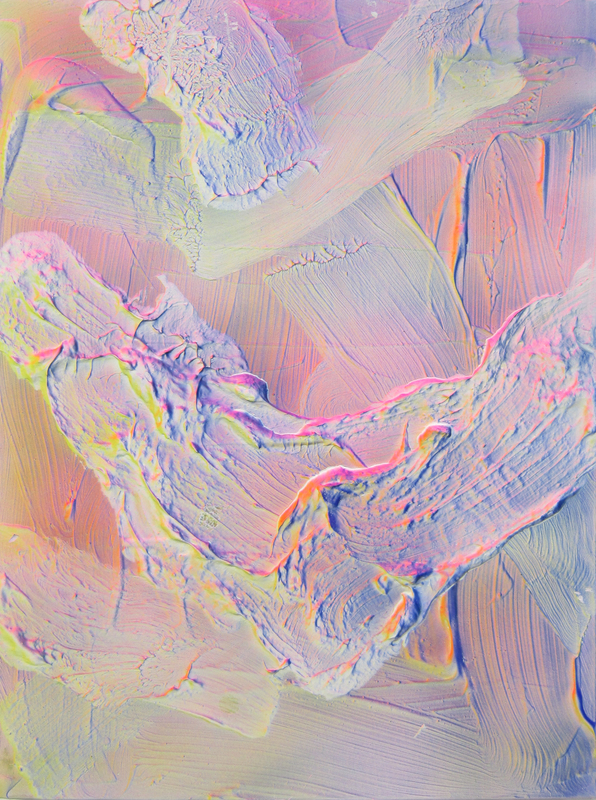 Although Pelc-McArthur recognizes that she is not the only artist experimenting with this technique of acrylic painting, she said she has worked to develop a unique way of layering color and texture in order to create the appearance of a digital screen on canvas. Tremblay also expressed her fascination with achieving a digital and technological aesthetic using physical materials. Artists such as Pelc-McArthur are able to explore the concept of digital art, not only through digital means, but also through its tangible, physical form. “The perfect example is Lauren’s paintings—they are paintings made of paint, but they are treating the subject of the digital. For me, there’s something very interesting there,” Tremblay said. After establishing that this was an idea worth exploring, Tremblay searched for other pieces that could complement and add to Pelc-McArthur’s. She soon found Amy Brener, an artist from New York, whose work includes large sheets of silicone and plastic encasing small objects like dried flowers, pills and buttons. The sheets are shaped to resemble the human figure, with circles imprinted on the chest, large shoulder pads and a narrow waist and neck. Cat Bluemke, an artist from Chicago, contributed her intricately-etched portraits of classic figures from Western art history—such as Michelangelo’s David and Saint Lucia—on panes of glass and acrylic sheets. All three of the artists’ works give unique insight into how art is influenced by digital prevalence. Not only does the exhibition evoke a conversation about technology and artistry, but it also demands a level of engagement with the pieces themselves. Pelc-McArthur’s paintings, for example, appear as digital art would on a screen but, upon a closer inspection, layers of paint and brushstrokes become visible. As a sort of trick of the mind, the line between digital and physical begins to blur. Pelc-Arthur’s paintings take on various colours and light, depending on the angle from which they are viewed. From one side, they might seem pink, from another blue and another yellow. When looked at face-on, Pelc-McArthur said the layers of texture and color “create a certain amount of depth and space” that evoke feelings of both confusion and intrigue. Galerie Projet Pangée is on the fourth floor of the Belgo Building, which is open from noon to 5 p.m., Wednesday to Saturday. Entrance is free.